The interregional exhibition of traditional sewing by craftspeople of the North was opened on the 6th of April in the Museum and Exhibition complex named after Ivan Shemanovskiy. The huge exhibition impresses with diversity, techniques, ideas, a color palette. 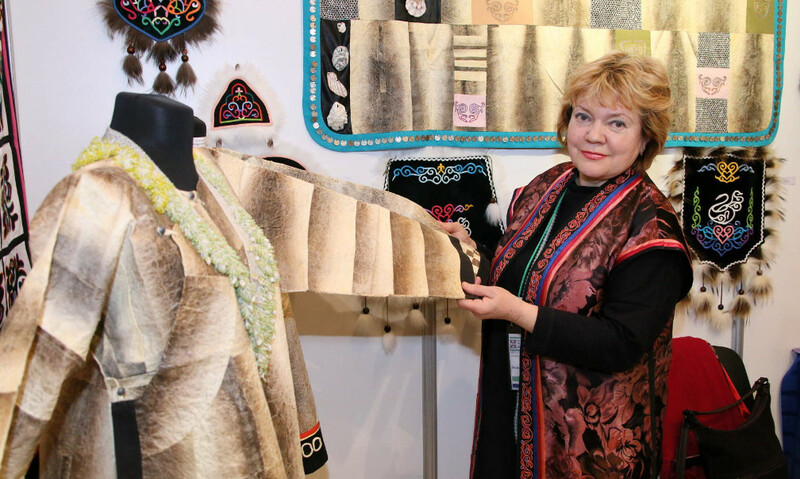 More than 500 unique products were presented by craftspeople from Yamal, Yugra, Chukotka, Krasnoyarsk and Khabarovsk territories. One of the participants of the exhibition, Oksana Bayuta from Khabarovsk Krai brought amazing art-works made of fish skin. “These are traditional products of our region. In the 1930-ies of the last century people, who sewed products of fish skin and wore them, were called fish eaters”, she told to a correspondent of the news agency “Sever-Press”. Such thing is windproof and waterproof. It is sewed of the pink salmon, keta, pike, taimen and catfish. “Processing of fish skin is very long. Preparatory work takes a lot of time. It takes a year to collect skins, then to clean them from fat and to dry. Only then craftswomen begin to work, what takes another year. Thus, it will take two years to sew a robe or a carpet “Kumalan”. The art-works are expensive; some of them reach 400 thousand rubles at the price. In addition, Khabarovsk Krai is famous for Nanai and Ul’chi embroideries and little carpets of the deer, wolverine, fox, squirrel and duck. Previously, they were used to make home warmer, now they are bought for beauty. In Moscow our products are awaited and purchased. Bracelets, smart phone cases, bags made of fish skin are popular”, said Oksana Bayuta. A craftswoman Oktyabrina Agicheva from Purovsky district has been busy with the craft since her childhood. She sews suits on the basis of legends of the North. Harmony of color, bright ornament and unusual lacing are seen in her works. “Now they will see my know-how at the exhibition, and again the whole Yamal will start wearing it”, she said. Her dream is to revive ancient folk crafts in Yamal. A craftswoman Svetlana Aksenova from Taimyr Autonomous Okrug took over experience from her mother, who was not only a craftswoman, but also was busy with blacksmithing. She forged amulets of brass, of files and even nails. There are tsar’s coins and buttons on the clothes in addition to the national ornament. “It became a tradition since ancient times, when merchants came to the fair and exchanged furs for coins”, the craftswoman shared. The first deputy director of the department of culture of Yamal Stas Chernavskikh is sure that the exhibition will be held at the high level. “It will become traditional in Yamal. We will extend our horizons, increase the number of participants”, he said. The program of the exhibition includes work of the creative laboratory, master classes, the interactive playground for children, the opportunity to take pictures in national clothes with a live deer and a Husky dog.